Police Siren, Ambulance Siren, and Console Mount Emergency Vehicle Siren That is the New Standard of Excellence! With the SA-400M Mechanical Classic Siren we have taken the time tested SA-400 and added a tone that will change the way drivers respond to your approach. 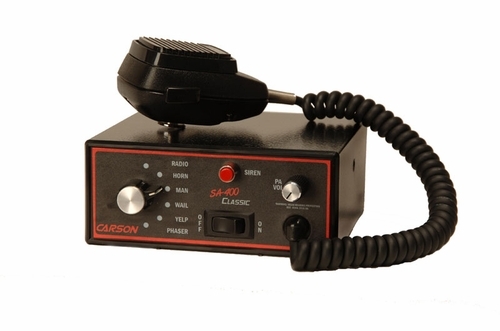 SA-400 is the industry standard in police sirens & fire sirens. With the SA-400 Mechanical siren, we combine the ruggedness, the sheer power with the new Mechanical tone, plus we added a silver look to the siren that is sure to look great in the console. The result of all these additions and changes is a police siren & fire siren that clears intersections with ease as it packs a punch with the "Big Engine" sound. Call response time, safety and the reduction of accidents when in route to calls are top priorities for all first responders. With the SA-400M Classic Mechanical, you'll have the peace-of-mind to Run Fast, Sound Big and Arrive Safe! With the 200 watt capability you can power 2 speakers at the same time with the same tone. This is just another addition that makes the SA-400M Mechanical siren one of the best values and simply one of the most effect police siren, fire siren or ambulance siren that is available on the market today! Control the siren with a rotary switch that allows you to select siren tones or your radio as an output to the speaker. You can also configure 2 momentary push buttons that will allow for siren tone override. Control your radio and PA volume with 2 volume knobs and finally a master on/off switch finishes out the faceplate for the siren. The noise-cancelling PA microphone is a high quality siren microphone with a large push-to-talk (PTT) button that is easy to use even in the dark. The face plate lights up in the dark with the LED back lighting that can be controlled via your vehicles dimmer circuit. You can also control your siren by using the factory horn circuit from your vehicle. This feature is called the Horn Ring Cycler 2 (HRC2). That allows you to operate the siren hands free by cycling through the siren tones simply by pressing your horn. Wire up the Siren Cutout / Park kill feature so that when you arrive on scene and open your door the siren will shut off. We recommend turning your siren off before that time though to save the ears of citizens or co-workers! Internal fusing prevents short circuit / overheating and with an output and power LED indicator light on the front panel, you don't have to take the entire siren out before you begin to diagnose any problem you may have. Another notable feature of the siren is that to wire the siren, you don't need a harness. The siren has screw down terminals so that you can simply strip your wire, then screw it down to the back of the siren. If for some reason that you need to take your siren out, remove the wiring block and take it away. You don't have to cut wires in order to do this. A 5 year warranty provides peace of mind that if you need service we are here for you! NOTE: The siren sounds listed below are recorded reproductions and may not represent the true sound from a siren speaker.